Attempting to goad more int'l pressure on Israel to extend construction freeze, Peace Now warns that 2,066 Jewish homes can be built immediately. In an attempt to scare the world into increasing the already heavy pressure on Israel to extend the construction freeze, the ultra-left Peace Now organization announces that 2,066 homes are ready to be built on Sept. 26 if the freeze is not extended – and thousands more are only one step away. The 2,066 units, in 42 different Jewish communities throughout Judea and Samaria, need no further permits or approvals for construction to begin. Among them are 300 in Givat Ze’ev, just north of Jerusalem, and another 260 in the hareidi-religious city Modiin Illit (Kiryat Sefer). In addition, work on 24 units can be immediately begun in Kiryat Arba, 18 in Tapuach, and 70 in Talmon. The goal and raison d’etre of Peace Now and sister organizations such as Yesh Din is to try to ensure that no Jews live in Judea and Samaria (Yesha), thereby promoting the racist concept of areas being "judenrein". The groups engage in lawfare within Israel, filing suits to challenge ownership of plots, sending airplanes over Yesha to check that no construction is taking place and photographing finds-from patios to synagogues. They publicize information on Jewish settlements, and run campaigns to further their goals. They are funded generously by anti Zionist and leftist sources. 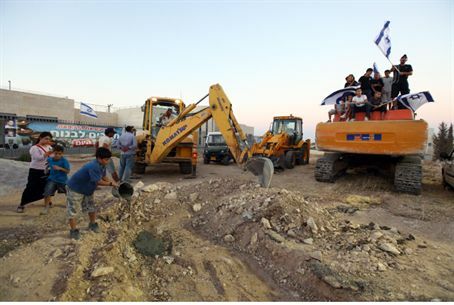 The city of Ariel has 136 units ready for immediate construction, according to Peace Now, while Vered Yericho has 41, Shilo – 22, Kochav HaShachar – 24, Barkan – 62, Mevo Horon – 70, Elazar – 58, Nili – 46, and Tzofim – 50 units.